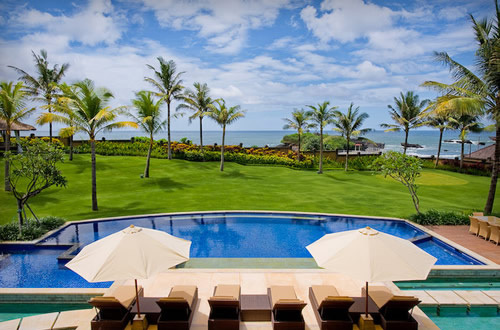 Beach front villas in canggu - Villa Semarapura is a beachfront villa, located between Canggu and Tanah Lot, 20 minutes from Seminyak on Bali’s southwest coast. This private Bali rental villa is comprised of a series of pavilions, swimming pool and ornamental ponds, leisurely spread throughout an expansive 5000 square metres of rolling lawns. Living, dining and sleeping pavilions feature glass doors; the villa has a 180-degree panoramic sea view with magnificent Bali sunsets. The five expansive bedrooms are comfortable and spacious. All have timber floors and all are equipped with TVs, DVD players and iPod docks. Four bedrooms are furnished with king size beds and one is furnished with twin beds that can be converted to a king bed. All have walk-in robes apart from the twin bedroom, where the wardrobes are positioned in the corridor. Ensuite bathrooms feature andesite floors, granite vanities, white bathtubs and walk in mosaic showers. Four of the bathrooms boast an outdoor shower as well as an indoor shower.